If you try one new dish this year make it this one, my current favourite recipe. It is quick and tastes bloody gorgeous! I ate the kebabs with pilaf, which is traditionally a spiced rice dish, but I made it with quinoa because it is probably the healthiest food on the planet. Alternatively you could eat them in pitta bread with some salad and yoghurt. The halloumi and veg need to sit in the tandoori marinade for atleast half an hour before cooking. You will need approx eight skewers (disposable ones are available from supermarkets). Preheat the oven to 190 degrees/gas mark 5. To make the kebabs, mix all the marinade ingredients together, add the halloumi cheese, onion, red pepper and courgette. Mix it all up, cover and place in the fridge for atleast half an hour. Put the marinated halloumi and veg on to skewers, place on a non-stick baking tray and cook in the oven until starting to go golden, approx 20 mins. Turn 3 or 4 times to prevent burning. To make the pilaf, fry the cumin seeds in some oil in a saucepan for one minute, then add the rice or quinoa. Add double the water and the peas, and simmer and stir it until done. Before serving add the parsley and season with salt and pepper. 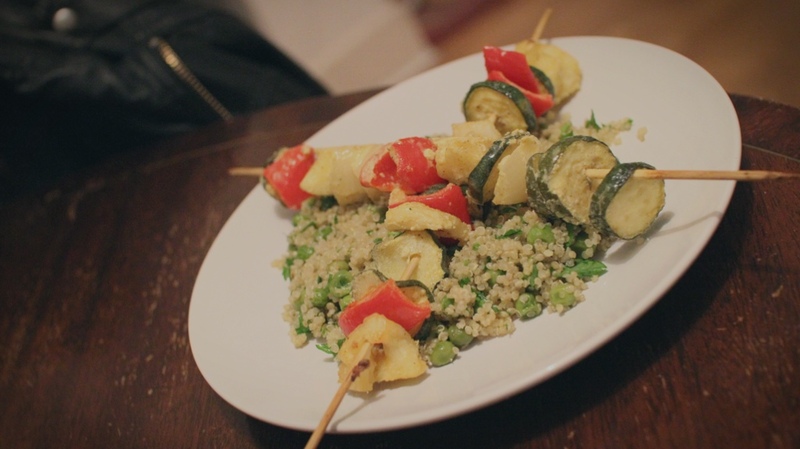 Serve the pilaf with the kebabs on top, sliding them off the skewers first if you wish.